The Jangelafructoling is a candy-based Borderling. It resembles a large, hairy reptilian monster. Sharp, crystalline teeth line its long, pointed snout. A large tongue, with a needle at the tip, is inside the Borderling’s mouth. On the top and bottom jaw are two eyes each. They consist of hard or soft candy. Jagged horns jut out from its shaggy head. The Jangelafructoling's hair has the same substance as cotton candy, and it covers most of the Borderling’s upper body, lower arms and feet, and the tip of its tail. Underneath its massive arms are smaller arms which are humanlike in appearance. It has massive paws with large, curved claws. Out of its rump is a long, tapering tail with a fluffy spiked club. The Jangelafructoling is made out of 189,454 different variations of candies from Earth and from the Externus. Each individual Borderling has a different arrangement of candy growing from their bodies. Its body regenerates within seconds after being cut, broken, or melted. Wounds will heal with different variations of candy from before. Inside its body are internal organs made out of gummy material and jelly, which is submerged in juice with the same color. The Jangelafructoling speaks with a harsh, trailing growl. Its speech is always high in pitch, and when threatened or anxious, the Borderling will growl in short bursts that sound like chuckling or laughing. An impure Jangelafructoling will have a mottled appearance and the smell of decay. Its skin and muscle tissue falls apart easily, and will only survive for 4 hours after manifesting. The Jangelafructoling can be found nearby shops where candy is sold. Warehouses, cafés, candy shops, theaters, gas stations, and convenience stores have a change in having a Jangelafructoling visitation. Storage places and back alleys are its ideal places to stay. It enters our world out of discarded candy wrappers. At first, the Jangelafructoling resembles a colorful thin strand of smoke. Within seconds, it materializes head-first into its original form. The Jangelafructoling is a patient and cunning predator. While in its destined location, it eagerly waits for prey. It appears to be absent-minded, swaying its head slightly from side to side and flexes its hands and paws. The Borderling crawls on four legs but it levitates most of the time. When idle, it snaps its jaws with anticipation, drooling threads of colorful syrup. When starving, the Jangelafructoling will search for others of its kind that are well nourished. 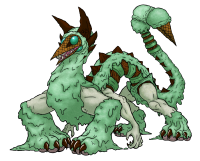 Using their candy generating abilities, the other Borderling will fill itself until immobile, stretching its stomach wall and tail in the process. The other Jangelafructoling will feed on the other after it regurgitates excess jelly. The Jangelafructoling predates other candy-related Borderlings. The Glucovermiling, and their hives compromise the Borderling’s diet. Before devouring an individual or a Glucovermiling, the Jangelafructoling will gut them with its claws or tear apart their limbs. An impure Jangelafructoling will generate rotten candy within the victim, causing it to be famished from the lack of fresh food and death to its prey. Because they can be contagious, their healthier counterparts will avoid them at all costs. The Jangelafructoling transforms its surroundings into a wide assortment of candy within its Effect Radius. 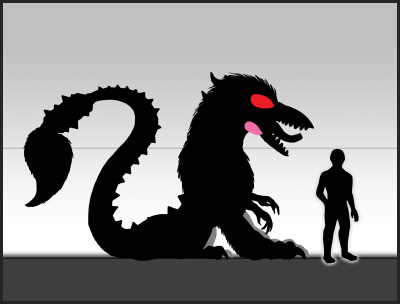 Each individual Jangelafructoling's effects will have different sizes. Plants and objects alike will have a thin shell of candy growing from them after 35 minutes of exposure. Fiends that stay for longer periods of time will have its surroundings transformed into a temporary lair of candy. Because of the bland taste of these candies, the Borderling will only use them as part of its temporary domain. The Jangelafructoling has a method to change Witnesses into candy for it to devour. With its humanlike hands, it pulls off a small part of itself and places them inside food. Teeth, fur, and scales are found in normal candies and pastries. 19 minutes after consumption, the Witness will undergo a transmutation. Their insides will either turn into jelly or liquify while their body changes into a variation of hard and soft candy. The process will take an hour and 3 minutes, and will cause some discomfort to the victim. They will go into a trance and will head towards the lair of the Jangelafructoling. Lacking any willpower, they will prop themselves against the wall or building to continue with its transformation. Once after the Witness becomes a grotesque mound of candy, the Jangelafructoling will begin to eat. It is a messy eater, digging its snout and claws into the prey, jelly spraying everywhere as it dives in with great satisfaction. It eats the filling first then the outer shell. The remains will be stored for further consumption.